The sharp drops in global stock markets has led to a fall in the current price earnings ratio's, however this fall needs to be tempered against lower GDP and earnings growth forecasts as the sharp US economic slowdown will impact most economies to varying degrees, shaving between 1.5% to 3% off the growth rates of many emerging markets. Therefore the following chart is updated to illustrate which stock markets represent value over others in terms of relative strength and growth into the end of 2008. The main change since the last update in November 2007, is in that the falls of 40% in China and Hong Kong have now made these markets more appealing though the recent global stock market analysis pointed to more downside before the markets make a low and resume a more sustainable uptrend. The clear market to stand out from this analysis is Russia, this was backed up by technical analysis as the Russian stock market has weathered the global equity downturn quite well. At the weak end of the spectrum, both the US and Japan come in towards the end and present the most risk to investors. Though much of Western Europe is not far behind therefore suggesting investors should be underweight in these markets. Look out for further technical analysis of the global stock markets in coming days in addition to the 7 markets covered in the lengthy Global Stock Market Forecasts and Outlook for 2008 article. Also for the latest on the Credit Crisis and outlook for the global stock markets subscribe to our FREE weekly newsletter. Please,are you write ? Price / book rates of global markets.Thanks. 04 Apr 08, 04:02 Am I missing something? Russia, with a P/E ratio of 12, is the cheapest, but the UK, with a P/E of 11, is the third most expensive? China and India, with ratios not seen since the Tech Crash, are "good" buys? Those growth rates will translate into higher earnings for russian companies hence higher stock prices to maintain or expand on the PE of 11. China and India are good long-term buys (despite short-term weakness) because they are growing by 8% and 10% per annum. I.e. against the 0 to 1% for UK and USA this year. Growth rates of 10% translate into as much as 30%+ earnings growth, depending on the sector. There PE of 25 falls to 16. Whereas a country in recession such as the US, will see a fall in earnings and hence lower stock prices AND higher PE. Where can I find country P/E ratios? 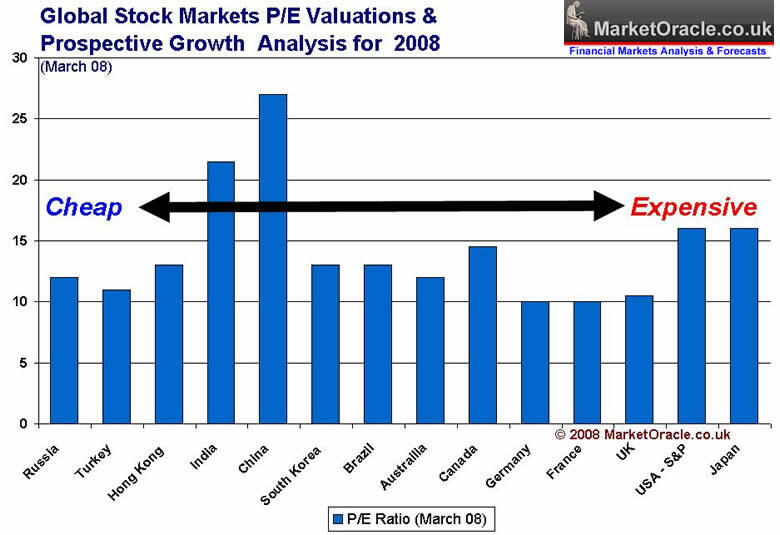 Hi - wonder if you can tell me where I can find current p/e's and estimated gdp growth of emerging markets? I'll schedule an updated analysis over the next couple of weeks.